Many Irish Art Gallery customers ask about how to care for their contemporary Irish Art purchase after it leaves the gallery so we have put together what we hope are some helpful tips. There is an inevitable aging process that affects art over the years. For most of us this will not be a problem. But for future generations if you follow Red Rag Irish Art Gallery's advice it should mean your Irish contemporary painting remains an admired family art possession today and for many years to come. Contemporary paintings and their frames are made from many different art materials.Â These include: varnish, paint, glue, canvas, wood, metal, gilding and plaster. Most of the art materials in modern Irish paintings respond to changes in relative humidity and temperature by expanding and contracting. If the relative humidity keeps on changing then the painting will expand and contract. Eventually it can be become stressed and begin to deteriorate. Symptoms to look for in paintings are: paint layer cracks; canvas splits; wood splits; flaking paint. To prevent deterioration and damage Irish Public Art galleries and museums control the environment with air conditioning and temperature control systems. This is not a practical solution for most private art collectors, so in the home a painting can be affected from high and low humidity. 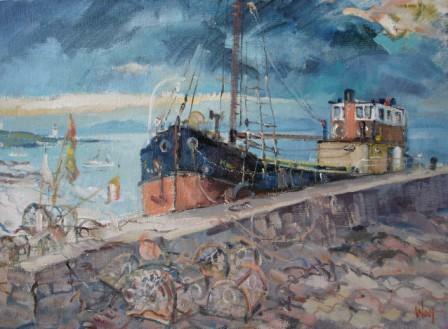 However, the Irish climate is generally favourable towards contemporary and antique paintings. During the summer well ventilated homes create a good environment for paintings.Â And although historically, the Irish winter months were once a concern because rooms suffered from damp and high humidity encouraging mould or mildew ' these days effective central heating has stopped these problems. So generally unless your central heating is seriously over heating and drying out the air there is little to be concerned about in terms of heat and humidity. For those Irish Art enthusiasts still seriously concerned about the environment around their paintings aim for a constant temperature between 65 and 75 degrees with a relative humidity of no more than 70%. Powder post beetles ' typically bore small holes (approx. 2mm in diameter) into wooden materials. These holes are generally the first visible evidence of powder post beetle infestation. Thunder Flies - seem to affect paintings hung near door ways in Irish Countryside properties. They manage to get under the glass and although harmless can be unsightly. They can be removed easily by our Irish Art Gallery Framer. 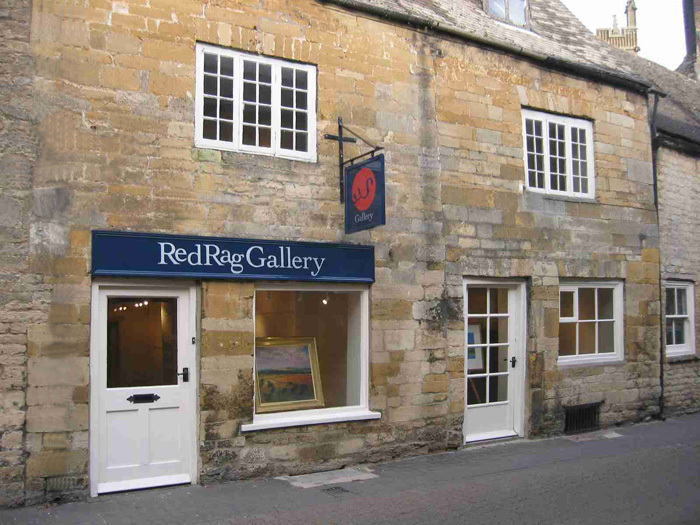 Customers of Red Rag often ask why some contemporary paintings have glass whilst others do not. In some cases the answer is just tradition. For example Scottish Artists have traditionally used glass around Oil paintings, so present day artists like George Devlin and James Watt carry on this tradition and tend mostly to use glass on their paintings. Occasionally for practical reasons artists want to protect oil paint which is still wet so glass is used. But increasingly Irish Artists such as Robert Ryan are using glass because of the overall enhanced effect that it provides. Glazing protects the surface of contemporary paintings and reduces the infiltration of light, dirt and dust. The two most common glazing materials used to frame Red Rag Irish paintings are acrylic sheet but more likely glass. Whether it is glass or acrylic, Red Rag Irish Art Gallery makes sure that the glazing material does not come into direct contact with the surface of the contemporary painting. Prolonged contact of the glazing with the surface of paintings can result in adhesion to the glazing, or can cause surface changes in the art work. A thick mat or a spacer in the frame keeps the painting from touching the glazing, but a regular annual check is advised. The above is really an 'ideal'� for those wanting to do everything possible to protect their contemporary art. Certainly if you follow all the Red Rag Irish Art Gallery suggestions you and your descendents will be assured years of trouble free enjoyment with your Irish Art investment. Most people will tend to leave their contemporary paintings on the wall for many years ' without noticing or experiencing any serious ill effects. Remember above all your Irish Art from Red Rag Gallery is to be enjoyed!